I love this stuff! I took the ranales piece and mixed it with "mom calls 911." it worked great! Just wish I'd had the chance to make some recordings w/ my old high school's ARP Odyssey. 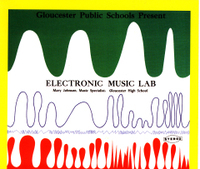 This Album was recorded by the folks in Mary Johnson's Electronic Music 1972 Class at Gloucester (MA) High School. Ms. Johnson was a fantastic supporter of people making music in any way they might find do-able. She had no qualms about letting the kids take the Sony Stereo reel-to-reel recorders home with them. Kids learned how to do "sound-on-sound", splice tape and use variable speed recording as components with whatever instruments or "found" objects they might use to create the desired sounds on these recordings. The kids in that class were from some of the most eclectic backgrounds: Such a fertile field for gathering such creations. Mary Johnson has passed on, as have some of the students who recorded that album.... This album is testimony to the creative explorations from some great folks in the Gloucester High School class of 1972.